In 1918, Sri Alapati Venkatramaiah, Sri Paruchuri Raghavaiah, Sri Vemuri Nagendram started the Rajaraja Narendra library, named after the King Raja Raja Narendra, who took initiation for development of Telugu literature. In those days, many of the youth were acquainted with Sanskrit and Telugu. Library had to depend on the books given by donors and the subscriptions from the villagers, as Government was not providing any grant at that time. In 1920, Madras State Government agreed to provide monetary assistance to libraries due to the efforts of Sri Konda Venkatappaiah Panthulu. That year itself, Rs. 20,000 was granted. But due to lack of effort or for any other unknown reasons, the library did not attain that grant. Until 1945, there was no assistance from Government. Initially there was no permanent building for the library. It was started in Sri Alapati Devaiah's choultry and after some time it was closed. Later Sri Uppala Krishnaiah reopened the library in Sri Pavuluri Venkaiah's 'Chaavidi'. On February 13, 1930, Sri Alapati Suryanarayana registered the library with the help of some of his friends and maintained it in rented house for some time and later in his own house. Donations were also received in the form of land rentals on the occation of Sivarathri Tirunallu and from auction of the rights for weighing the food grains. The library developed very rapidly with many novels and magazines. Memberships were also raised. Every year, organizing committee was elected for the library's maintenance. After some time, the number of readers was decreased due to insufficient space in library. Then the youth requested Sri Pavuluri Venkaiah Chowdary to give his house for library. He cordially obliged their request and the library was started in the new house on August 21, 1942. After some time, Sri Chowdary registered the house permanently for the library, without any one's knowledge. This library helped in increasing patriotism in villagers. 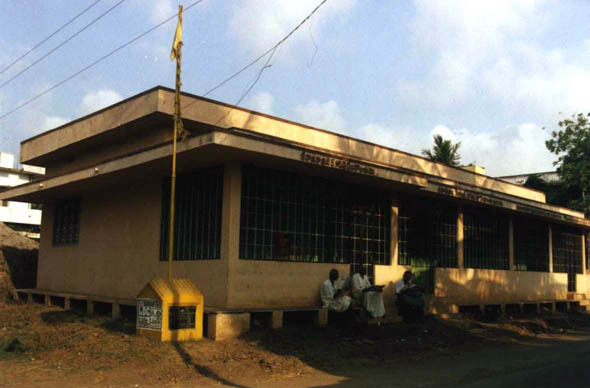 Prominent personalities in Library Movement like Sarvasri Gadicharla, Unnava, Paturi, Saranu gave lectures in this library. In 1947. Gram Panchayathi gave a radio for the library. Many people used to visit the library to listen these radio programs. Even today also, the library has its prominence in the minds of villagers. With more than 7,000 books in 17 almirahs, it is still attracting them.